What has happened in Panjab during the last few days is unprecedented in modern Indian history. Back in April 1982, the waters of three Panjab rivers started turning red when Indira Gandhi laid the foundation stone at the Panjab section of the doomed Satluj Yamuna Link (SYL) Canal at the village of Kapoori in Patiala. A few days ago it was at the same village of Kapoori, that Congress MLA’s joined people to fill in the canal dug-outs, an exercise started without the bill to de-notify the land acquired for use of the canal, even being passed in the State Assembly. Ironically, it was the Badal government who first issued two notices in February 1978, for the acquisition of land for this project. The blood-stained history of this failed project at its very conception and execution, has been questionable with both the Congress and Akali Dal being sinners. As the 2017 elections draw near, the Panjab water issue has once again emerged as a hot topic. Badal has taken the extreme action to return over 5000 acres of land acquired for the canal to farmers free of cost and repaid the entire amount paid by neighbour state Haryana, for land for the canal project, in a move considered to outmanoeuvre Captain Amrinder Singh in the political arena. The distribution of Panjab’s waters was a key issue of the 1978 Anandpur Sahib resolution which was widely accepted and welcomed by Sikhs worldwide. It was the Sikhs of the ‘Dharam Yudh Morcha’ who led the agitation against the sections of the 1966 Panjab Reorganisation Act, which allotted over 75% of the available Panjab waters to the non-riparian areas of Rajasthan, Haryana and Delhi, a move which would destroy the future of all of Panjab’s people, not just the Sikhs. The riparian principle (laws relating to or situated on the banks of a river) stands embodied in age old international laws; where a river lies wholly within the territory of one State, it entirely belongs to that state, and no other state has any rights therein. The SYL canal will be buried within the next few days with JCB earth movers already being deployed to fill in the land and the original owners have taken over the project by their own will. Never before and perhaps never again, has such a big project like the SYL Canal been dictated by political considerations. 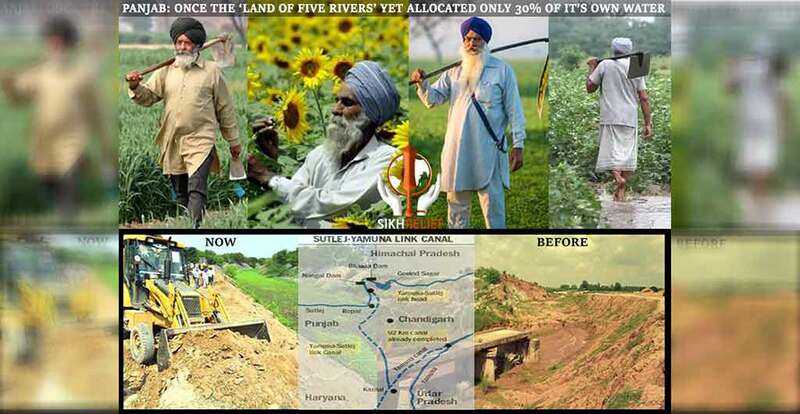 Only 30 per cent of the land in Panjab that owns these three rivers is under canal irrigation. It is nowhere else in the country that 70 per cent of the waters from the rivers in any state have been diverted to the neighbouring states. It is not just the canal that has been buried…. it can rightly be termed as the graveyard of a monumental blunder.